ROP's modified atmosphere (MA) bulk liner and ROP's MA Ultra-thin film, two proven packaging alternatives for preserving the freshness of sweet cherries. ROP Ltd. has expended its family of freshness-preserving packaging line, offering bulk packaging for sweet cherries. To the established, world-wide accepted practice of packing sweet cherries into modified atmosphere packaging, ROP is now adding its own innovative packaging solutions presenting several characteristics which distinguish its product from the ordinary MA bulk packaging. "Both packaging solutions developed preserve firmness, reduce weight loss, prevent stem browning, inhibit microbial decay, minimize pitting and maintain good eating quality (through taster's panel as well as measurements of acidity and TSS values) of sweet cherry" says Shay Zeltzer, Head of Postharvest at ROP. "Growers and exporters will gain benefits from these packaging solutions not only by preservation of fruit freshness but also by cutting cost of packaging materials and having an attractive packaging that is crystal clear with superior antifog properties. Retailers and consumers will enjoy flavorful and juicy fruit and, not less important, our planet will benefit from less plastics impact and less waste" adds Zeltzer. 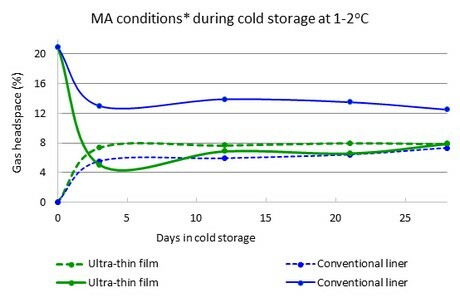 Following extensive R&D activities, ROP's polymer engineering together with its in-house postharvest lab came up with two MA packaging alternatives (a) bulk liner, and (b) Ultra-thin film wrap. Both types of packaging are suitable for use on standard packaging operation of sweet cherries. Different than ordinary MA bulk packaging, ROP's ExtendCast-Cherry is crystal clear so that the presentation of the cherries is not compromised. "The Ultra-thin MA film has several unique qualities" explains Dr. Wentao Gia, ROP's Polymer Engineer, "qualities that do not exist in other packaging". "Proprietary film casting methodology allows for production of the ultra-thin film that once sealed, creates unique gas composition within the packaging: at equilibrium state low oxygen percentage is stabilized while CO2 levels remains relatively low" she explain. "These preserve the texture and eating qualities of the fruit and at the same time control decay and mold growth" conclude Zeltzer. The Ultra-thin film is supplied in reels, substantially saving on shipping cost and storage of packaging material. Packing process is easily done with minor adjustments to trays-filling station on standard cherry packing lines. Packing procedure of using Ultra-thin film: (top left) The film is pulled over the tray first like a sheet over a bed; (top right) cherries are then poured into the tray; (bottom left) the film is trimmed and wrapped around the whole content of the box; and (bottom right) forming an air-tight sealed packaging.